Make C# thread-safe without using locks. 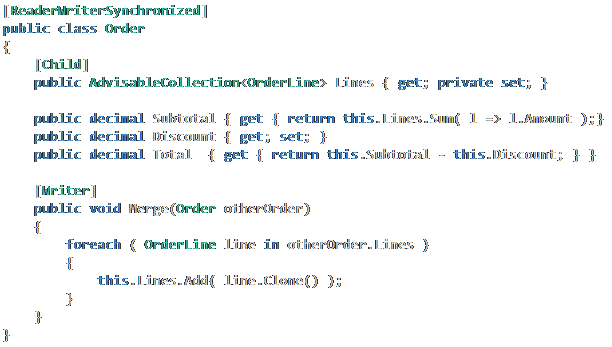 Resolve multithreading issues in C# with PostSharp threading models. Find threading bugs deterministically. No more random data race. No need for a PhD in computer science. 10 enhanced classes per project. Make your C# or VB applications thread-safe. Starting new threads and tasks in .NET languages is simple, but ensuring that objects are thread-safe is not. Make your C# code thread-safe without using locks. Address multithreading with machine-verified models. Higher abstraction – Don’t get lost in the details of multithreading code. Raise the level of abstraction by applying thread safety models with attributes. Design and implement – Choose thread-safety patterns when designing your application. Translate that design into a functioning code artifact easily and quickly. Free up your brain – Let your most experienced developers work on other thorny problems. Thanks to prebuilt threading models, any developer on the team can accurately and confidently deal with multithreading in your C# code. Thread Dispatching – A simple attribute allows you to easily dispatch work to background threads or to the UI. Model validation – Once you choose a model, PostSharp will ensure that you are not breaking the rules. Get deterministic build-time or run-time errors instead of risking data races. Make more of your unit tests – With randomness removed, even single-threaded unit tests will expose most threading issues. Deadlock detection – Deadlocks are hard to diagnose and will frustrate users more than a controlled crash. Avoid the “Not Responding” situation and instead receive a detailed exception that outlines the stack trace for each thread involved. Your choice – There are several valid approaches to thread safety in C#. We realize there is no silver bullet and offer you a number of models to choose from. Leverage your investment – PostSharp works with any C#/VB codebase. There’s no need to move to a different language to achieve thread safety: make your VB or C# code thread safe. Adopt incrementally – You can add thread safety one component at a time. There’s no need for a full application rewrite. Break free from routine TODAY and start delivering more in less time.